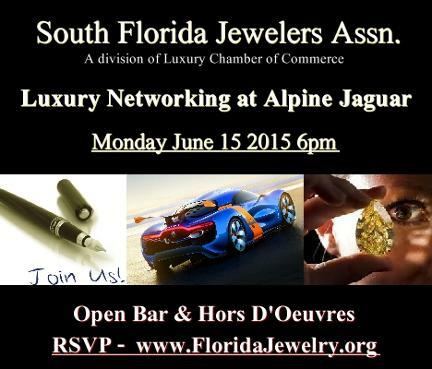 Welcome to South Florida Jeweler's Association. We are a newly founded division of Luxury Chamber of Commerce catering to the needs of Jeweler's in the South Florida Region. Along with our sister org we plan to host business networking events at local Jewelry stores and other luxury venues throughout the tri-county area including: Worth Ave in Palm Beach, Mizner Park area in Boca Raton, Las Olas in Fort Lauderdale, Bal Harbour Shops and Miracle Mile in Coral Gables. SFJA will launch on Monday February 19th at Maxwell Room. Until then please like us on Facebook and join our mailing list! Investment: FREE for Luxury Chamber & Jewelers Assn Members or $25.00 CASH ONLY at the door!